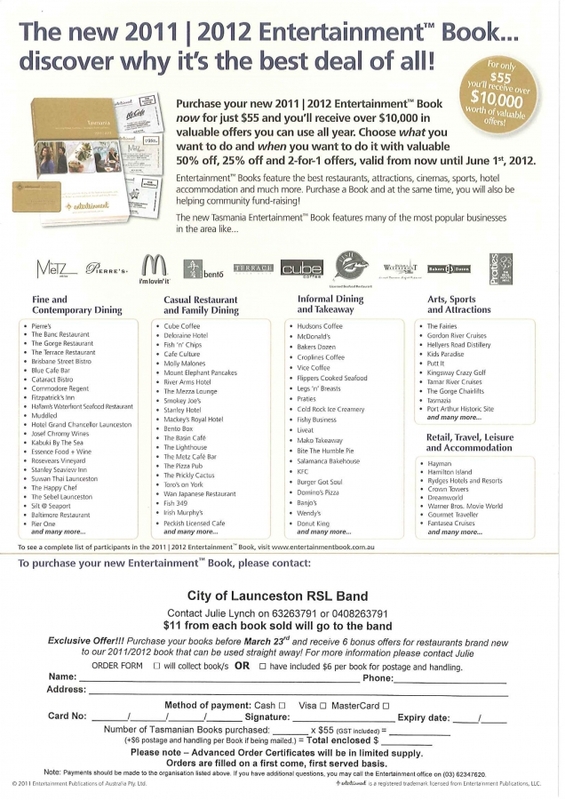 commented on "The City of Launceston RSL Band is fundraising again this year with the Entertainment Book. Support your community band by buying a ..."
COL RSL Entertainment Book Fundraiser! The City of Launceston RSL Band is fundraising again this year with the Entertainment Book. Support your community band by buying a 2011-2012 Entertainment Book today! $1,000's of savings for dining, accomodation & events in Tasmania for only $55! For more information & to purchase your book, go to our Downloads page or call Karen on 0406 633 973.